He’s among the most radical of the new-right politicians in Europe—and he’s poised to win the March elections. Amsterdam, The Netherlands—On January 23, Mark Rutte, the Dutch prime minister and leader of the center-right Liberal Party (VVD), wrote a 500-word letter “to all Dutch people” that appeared as a full-page ad in the country’s major newspapers. Behind the appeal to common decency, the message was clear: “We” are the real Dutch; those “people” are not; and anyone who can’t behave “normally,” in the Dutch way, is not welcome in the Netherlands. As critics were quick to point out, Rutte’s letter took for granted the widespread but unfounded notion that crime and public misbehavior are on the rise and that immigrants, particularly Muslims, are undermining a Dutch tradition of peaceful, tolerant coexistence. The public letter was a shrewd attempt on Rutte’s part to fend off Geert Wilders, the right-wing populist whose Party for Freedom (PVV) is poised to win the Dutch parliamentary elections on March 15. Polls predict that Wilders—who wants to leave the European Union, “de-Islamicize” the Netherlands by putting a ban on Muslim immigrants and refugees, lower taxes, abolish public broadcasting, and dramatically increase military spending—will garner close to 20 percent of the vote, corresponding to 30 deputies in the 150-seat Parliament. Rutte’s own party will likely end up in second place, with around 16 percent of the ballots. Meanwhile, the Labor Party (PvdA), the longstanding bastion of Dutch social democracy that is currently governing in a coalition with the VVD, is paying a heavy price for its support of EU-imposed austerity—ruthlessly enforced from Brussels by the PvdA’s own finance minister, Jeroen Dijsselbloem, who is also president of the Eurogroup. The PvdA’s constituency clearly finds this hard to swallow. In March, the party’s electoral share is predicted to shrink to 8 percent, down from 20 percent in 2012—landing the party in sixth place overall, a couple of percentage points behind three other parties on the left: the liberal democrats (D66), the Green Left (GroenLinks), and the Socialist Party (SP). The Dutch are struggling to make sense of this impending electoral earthquake. Wilders’s likely victory is something of an embarrassment for a country that has long liked to see itself as a beacon of forward-thinking common sense: as libertarian as the French but less arrogant; as hard-working as the Germans but with a better sense of humor; as socially conscious as the Scandinavians but more diverse; and anti-nationalist to a fault. An Islamophobic, Netherlands-first prime minister does not fit this picture. To be sure, it is tempting to see Wilders simply as another instance of the wave of right-wing xenophobia that is taking Europe by storm. But while the PVV’s links to France’s National Front, Germany’s Alternative für Deutschland (AfD), Britain’s UKIP and Italy’s Lega Nord are real enough, Wilders’s rise has deep Dutch roots. The country never really recovered from the murders of Pim Fortuyn in 2002 and Theo van Gogh in 2004. “Wilders’s emergence on the national stage really goes back to two assassinations,” Koen Vossen, a political scientist at the University of Nijmegen who has followed the PVV for years, told me in January. “The murders of the politician Pim Fortuyn, in 2002, and the filmmaker Theo van Gogh two years later were something of an electroshock to the Dutch national brain.” The country never fully recovered. Pim Fortuyn (1948-2002) was the founding father of a homegrown, Dutch brand of xenophobic populism. A sociology professor and high-level state appointee, Fortuyn passed through the labor party and liberal party before forming his own. He ran for the 2002 parliamentary elections on a radically anti-immigrant and anti-Islam platform. The Netherlands, he said, was “full,” and Islam was “a retrograde culture.” As an openly gay academic and libertarian—he liked to say that he abhorred Muslims’ intolerance but enjoyed sleeping with Moroccan boys—Fortuyn put a new face on right-wing Dutch nationalism, laying the foundation for Wilders’s later rise. Until then, the radical right had been associated with Hans Janmaat, an anodyne politician who looked like a disgruntled office employee and was treated like a pariah in parliament, where held a seat for four years in the 1980s. Fortuyn’s emergence sent tremors through a political landscape that had been extraordinarily stable for decades. Government coalitions, based on carefully negotiated compromises, were generally forged among the three largest parties—Labor, the Christian Democrats (CDA), and the Liberals—sometimes with support from smaller groups. (No one political party in the history of postwar Dutch democracy has ever held an absolute majority.) The system was thrown into permanent disarray in May 2002, when, nine days before the elections, Fortuyn was assassinated by a Dutch environmental activist. Two years later, in November 2004, the day George W. Bush was re-elected president, the Netherlands suffered a second trauma. Filmmaker, journalist, and professional provocateur Theo van Gogh—a ruthless critic of Islam—was killed in broad daylight while biking through a busy street in the eastern part of Amsterdam. This time the assassin was a 26-year-old Dutch Muslim of Moroccan descent. Van Gogh’s murder strengthened anti-immigrant sentiment among the lower middle classes as well as the intellectual elite. Fortuyn wasn’t the first Dutch politician to talk tough on immigration. Still, “Fortuyn used to say that he was the only one who dared break the politically correct taboos surrounding the growing immigration problem, but that he’d no doubt be punished for it,” says Vossen, the political scientist. “For many, his death proved that he was right.” Van Gogh’s murder two years later further strengthened the growing anti-immigrant sentiment among the lower middle classes. But it also drew a segment of the country’s intellectual elite into that camp—for starters, the filmmaker’s devastated personal friends, several of whom experienced a Christopher Hitchens–like conversion overnight. With this unusual elite endorsement, anti-immigrant rhetoric gained a new legitimacy. Meanwhile, in public opinion the notion solidified that the country’s immigration policies had failed and that the presence of “unintegrated” foreigners—particularly from Turkey and Morocco—was a problem that called for a drastic solution. Statistics don’t exactly support this impression. True, with almost 17 million inhabitants in a country twice the size of New Jersey, the Netherlands is Europe’s most densely populated state, and since the early 1960s, the country has seen the percentage of foreign-born inhabitants double—thanks, first, to an influx from former colonies like Surinam and Indonesia and, later, labor migration from the Mediterranean. Still, compared with other European countries, immigration has been a relatively minor factor in the growth of the population since 2000. In 2016, 22.1 percent of the population was non-Dutch, including some 385,000 citizens of Moroccan descent and 400,000 of Turkish ancestry. (Until very recently, Holland divided its population into two categories: “autochthonous,” originally Dutch, and “allochthonous,” defined as anyone who was born abroad or has at least one parent who was.) In 2014, ten other EU countries had higher percentages of immigrants. Among the intellectual converts during the traumatic fall of 2004 was Martin Bosma, a 40-year-old political scientist who had worked for years as a mainstream journalist. Days after the Van Gogh assassination—which happened to occur 600 feet from his doorstep—Bosma quit his job and offered his services to Geert Wilders, a deputy in parliament who at that point had just left the center-right VVD but held on to his seat, determined to start his own movement. By now, Bosma’s success is indisputable. Concepts championed by the PVV have become household notions in Dutch political debate. Terms like “Islamicization,” “mass immigration,” and “leftist hobbies” are serving to frame an alarmist narrative that’s proven increasingly effective. The story goes more or less like this: The unrelenting influx of Muslim immigrants is about to turn the Netherlands into an Islamic nation, thanks in large part to the complicity of left-wing elites. These elites, who came to power after winning the 1960s culture wars, have ignored the plight of their fellow Dutch citizens. Instead, they have been busy attending to their left-wing hobbies: taxpayer support for the arts and public media; the defense of multiculturalism; development aid; opening the country’s doors to refugees from the entire world; and newfangled pedagogies that have wrecked the country’s educational system. To make things worse, those same elites have allowed EU bureaucrats to impose ruthless cuts, eroding public services for regular Dutch citizens, at the same time that lavish amounts of money are spent on free food, clothes, and housing for ungrateful refugees who pose a danger to Dutch society. Meanwhile, the Dutch have seen their neighborhoods taken over by Muslim hordes. The PVV is hard to classify. Unlike other Dutch political parties, it has no formal members other than Wilders himself, who is determined to rule his “movement” with an iron hand—although he hasn’t been able to prevent some highly embarrassing behavior from his associates. “I don’t think it makes much sense to call the PVV fascist,” says Vossen. “To be fascist, a party must have a clear anti-democratic component. And although the PVV’s internal structure is anything but democratic, programmatically the party does not reject democracy; to the contrary.” The core of Wilders’s electorate are members of the lower middle classes with a relative low level of education, who feel alienated from the college-bred political class. They include long-term unemployed and others who depend on Holland’s steadily eroding social safety net. Those drawn to his message feel they have lost—or stand to lose—a lot: job security, quality of life, and access to public services. Pride is an important weapon in Wilders’s battle against political correctness. Like his German AfD counterpart, Frauke Petry, who is telling Germans they should stop being ashamed of their own history, Wilders assures his voters that disliking their Turkish neighbor does not make them racist, despite what the left elites might say. This line of argument has hit a deep collective nerve. 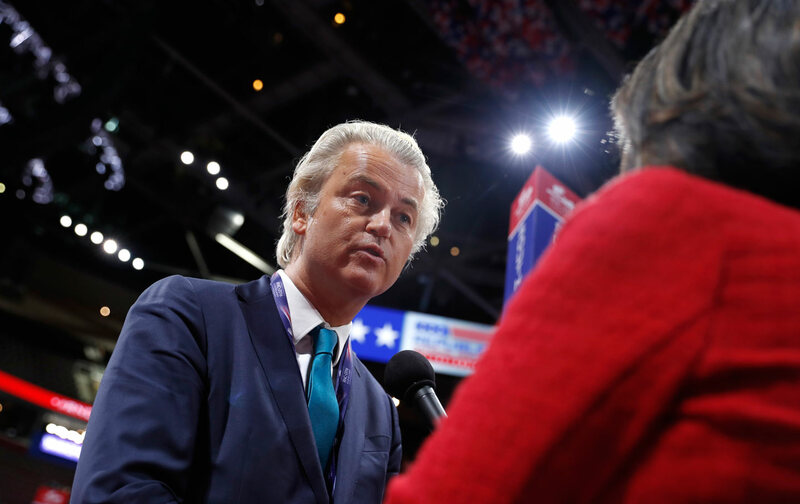 Ironically, the very thing that makes Wilders an international embarrassment to the Dutch—his challenge to their cherished self-image as the epitome of progressive tolerance—is one of his strongest trump cards. The Netherlands has never fully come to terms with its slave-trading past, its bloody colonial repression, or, for that matter, its collaboration with the Nazis during World War II. This collective bad conscience prompts neuroses that to outsiders can seem baffling. Over the past couple of years, for example, the country has been engaged in a cultural battle over the feast of Saint Nicholas. As part of this tradition, for several weeks every November and December, white men dressed as bearded bishops distribute gifts and candy to children, along with an army of “Black Petes”: servants in blackface, donning afro wigs, Moorish clothing, and bright-red lips. When civil-society groups joined in a campaign to change the casting, arguing that the servant’s character was offensive to many Dutch citizens of color, a heated national debate ensued. A broad set of the population rose in defense of what they saw as an innocent tradition; some claimed, implausibly, that race had nothing to do with it because Pete’s face was black from chimney soot. It was hard to say what piqued people most: changing the tradition or the suggestion that, by celebrating it, they had been racists all along. Prime Minister Rutte’s January letter subtly tapped into this resentment by stating that those who do not belong in the Netherlands are the people who “harass gays, yell at women in short skirts, or call regular Dutch people racists.” Healthy Dutch pride, in other words, is not a gateway to fascism; in fact, it’s their lack of racism that makes the Dutch who they are. It is difficult to predict the national fallout of a Wilders victory in March. Rutte’s promise not to join forces with the PVV is meant in part to convince the electorate that a vote for Wilders would be wasted. Still, Rutte would no doubt be delighted if, after March 15, he could afford to give the white-haired populist the cold shoulder. Wilders is a wild card. He refuses to play by the rules of Dutch politics, which are based on compromise and mutual trust. In 2010, the PVV pledged support for a Rutte-led coalition between the liberal VVD and the Christian Democrats, only to withdraw it two years later, causing the cabinet to fall. Rutte hasn’t forgotten that act of sabotage. The other parties, too, have made clear they’ll do what it takes to keep Wilders from governing. But the five-party agreement that would be needed for a PVV-less governing coalition will be hard to forge. A more serious problem is that quarantining Wilders on principle further confirms his constituency in their conviction that the political elites will continue to ignore their concerns. Wilders, for his part, has shown some willingness to soften some of his positions. In early February, he said this his plan to prohibit the Quran—which he’s called a “fascist book” that “incites violence”—would not mean that the police would be instructed to raid Muslim households.